Orlando Fun and Food is asking all their readers to help them by donating money to help support the Special Olympics here in Florida. 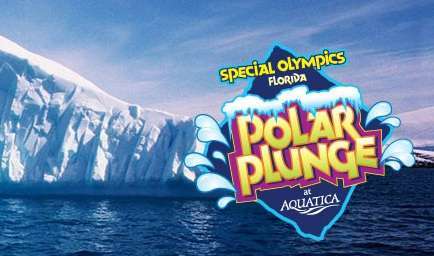 Jason, the owner of Orlando Fun and Food has decided to take the plunge into the waters at Aquatica on February 7th, 2015 for the Polar Plunge! The Polar Plunge is a statewide fundraiser during which individuals and teams, alongside Special Olympics athletes raise money for the privilege of Plunging into the chilled down wave pool. So why has Jason decided to take the Polar Plunge? Everyone deserves a chance at a happy and purposeful life. Yet people with intellectual disabilities face doubt, barriers and low expectations. For many, Special Olympics is the only place where they find an opportunity to participate in their communities, develop belief in themselves, and feel like champions. By participating in the Polar Plunge,we are helping to reach more people who want to participate in Special Olympics!!! So what are we asking of you exactly??? First off, I cannot take the plunge without your help! I am looking to personally raise 2,500 to go to the Special Olympics! To donate to this amazing event click on the donate button on the side bar of this site! All the money you donate is tax deductible and you will receive a email with your donation for tax purposes! You can also help Orlando Fun and Food by spreading the word about our participation in the Polar Plunge!!! Share this article with all your friends and blow up social media with the hashtag #PolarPlunge and #OrlandoFunandFood! You can also share my donation page with everyone you know!!! The page can be found here! Lastly, I want to personally thank you all for helping out in this amazing cause. I work as a Paramedic at a Children’s Hospital and this cause really warms my heart! Without your help I will not be able to show my support! Your donation goes directly to the Special Olympics and they could really use your help! Thank you again and stay tuned for our progress!!! Previous Post 5 Money Saving Tips Disney World Doesn’t Want You To Know! Next Post Exclusive Interview With Manish Dayal about The Hundred Foot Journey on DVD Now!